The first time he set his eyes on her, he did not like her. He felt she talked too much and even thought of her as loose. She was also very dark—her skin was the blackness of night. Though her eyes were a clear white, and her teeth, when she smiled, send forth a clean sparkle. All his friends knew how much he disliked dark girls. Because he was quite dark-skinned himself, he always felt some fairness would do him better. And his kids in the future. 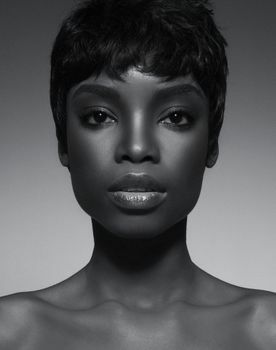 To him, all dark girls are the same—suffered a common fate. It is not very easy to tell the pretty ones from the not-so-pretty ones. Because whatever beauty they have is hidden away in the darkness of their skin, there to lie, only to be awakened by some sort of lightening. Fortunately, there are now products and technologies that help, some very cheap and easy to obtain. But he didn’t want that for any of his daughters to come. He didn’t want people to struggle to determine if they were cute or not. Or argue about it. He wanted for them beauty that screamed, so loud and powerful one could not resist to stare. He met her first at his friend’s birthday party. A party that made him remember the first miracle of Jesus Christ. His friend, George, had been having reservations about celebrating his birthday ever since. It could be said that he and the other boys literally pushed him through it eventually. It was exam period— that time of the semester when all students have washed their pots and turned foragers. But, miraculously, the party hadn’t turned out so bad. They had more crowd, more wine and more ladies than they actually bargained for. In the famine brought along by the onset of the exams, the come-one-come-all attitude of AOU students had become intensified. At the end, George’s room could not contain the so many guests that trooped in, so they had to all move outside. The rectangular space in front of the lodge was large enough. Many of the guys had come along with extra bottles, majorly those cheap bottles of Baron this and Baron that type of red wine that costs nothing more than N500. Some with bottles of that urine-coloured whiskey you could always tell is merely coloured kai-kai. There was quite a number of extra cups so the party rolled off. Ayo, one of their friends, connected his phone to George’s home theatre and with the extra speakers he brought, party music was set. It had been surprising to him, admirably so too, how every soul worked together towards the success of the party. As though it was a general party and not just a single person’s birthday. Because there was no cake, he quickly carried away the high plastic table a heavyset girl had carried out and dropped at the centre of the space. The girl had turned to look at him in surprise and he winked at her, getting her the more confused. But he knew what he did. Leaving the table there would only pronounce the utter ‘cakelessness’ of the party. Truth is, as with the majority of the guys there, he was really not bothered about whether there was a cake or not. The drinks were more important. And they were just enough. And then too, the absence of the cake would save them from that awkward birthday song where everybody would open their mouths croaking together like female frogs in heat. He didn’t understand why adults still bothered to do that at birthdays. The party has really kicked off and couples has started jiggling and cuddling on the dance ground when Anita and her friend walked in. And everyone had noticed their entry. For one, Anita was shining like NEPA light. Her bright yellowness could get the sun jealous. To her luck, her skin was of the clear and spotless variety and getting a boyfriend never seemed to be much of a problem for her. Had she not been in the same department as him, he would have asked her out since their first year. But now his eyes were on the black girl Anita had walked in with. She seemed popular among the students. Very popular—the way they all seemed interested in talking, touching and coming close to her, creating the impression of someone sharing jollof rice at a wedding. He appeared the only one left out, the only one that did not know her. Or want her. Others readily gave her attention and at the corner where he stood with his half-filled plastic cup, he began to wonder if she was a celebrity he didn’t know about. Now she was talking with a new group of two boys and a girl. The way she talked, her bright smiles and gentle gesticulations and the way the people she was talking with listened too, caught his attention again. They nodded to every sentence that came from her lips, lavishing on her those kind of smiles that indicate something much more than their agreement of whatever she was saying. They adored her presence, it was obvious. He fought hard to understand it. The reason behind it. He would have thought her a lecturer, but he was sure no lecturer could come out so late in the night to attend a student’s birthday party. Then he saw one of the guys, the shorter of the two, reach into his pocket and brought out his phone. He extended the phone to her and she took it from him with the left hand, ever so absently. It wasn’t until she finished what she was saying that she bent and started pressing at the phone. After that, the other guy handed her his too and again, she accepted and did the same thing. From the corner where he was, observing them, he nodded and sipped from his cup. He understood now. She was a ‘farm tool’. A hoe on the job. Obviously she is new in town and needed as much clients as she could get. He was still thinking this and laughing in his mind when he heard someone say ‘Hi’ behind him, causing him to jerk. He turned and it was the same girl he was mauling in his mind that stared back at him. ‘Sorry, did I startle you?’ she asked him. He swallowed and applied a smile. ‘No, I’m fine,’ he said with his brows raised sarcastically higher. ‘Okay.’ She moved to stand beside him and he smelt her fragrance. He liked it, but it kind of amused him. The scent was balmy, archaically so, and somehow made him remember his grandmother’s Venus cream. He looked over her again now, her short hair, navy blue gown that stopped somewhere around her knees and glittering clutch purse. ‘I saw that you are quite lonely, care to talk?’ she said. The last thing he wanted and would do is to give out his number to the party hoe. ‘Something like that,’ he returned curtly. He gave her a slant nod, nearly rolling his eyes. Growing up with just his mother and three sisters had equipped him with more than was needed for a guy. ‘So what then turned you into a talkative?’ he asked, not bothering if the sarcasm in the words came out too apparent. He understood nothing of all the words she vomited—a way too much response to a simple straightforward question— but her accent had stood out. It wasn’t foreign, or anything too exceptional. It was just normal Nigerian accent that is nice and crisp on her lips. ‘So?’ he said, finding nothing else to say. She gave him a half-done smile he didn’t fully get. ‘I can’t really call myself a novelist yet, I mean with just one book, sounds ridiculous, right?’ She was smiling but he wasn’t. ‘You’ve written a novel?’ he asked. ‘What’s the name of your book?’ he had to cut in on her. She continued to smile. Somehow he found himself happy that she smiled a lot. She was staring at him, her smile now slight, her eyes narrowed. ‘Actually, that was a redone story,’ she said. She paused, her eyes on him. He shook his head, slightly. His cheeks were becoming warm, a sensation that was strange and somewhat amusing to him. A wisp of annoyance pricked him. He had seen her collect phones from the other two guys and entered her number for them herself so why would she change the process for him now? ‘I saw you giving out your numbers to the two guys you were standing with earlier,’ he said as he pressed in his numbers. He’d been very careful not to let even a thin slice of jealousy show. ‘Oh no, that wasn’t my number that I gave them,’ she said. He smiled and nodded. Turning back to the phone, he pressed the green symbol and the call was sent. He returned her phone to her. She took it back ever so absently and asked him his name. His phone started to ring. If he had known he was going to meet someone like her that evening, he would have changed the ringtone of his Blackberry to something calmer. He ended the call and saved her number with her full name—Adaeze Ilonna. ‘Why would someone scream at you?’ he asked her. ‘So since you stopped giving your number out to people, why then did you decide to go out of your way and allow me have it?’ he asked. She smiled and touched his cheek with a finger. ‘Let’s just say I like you.’ She adjusted her gown and walked away, leaving him motionless with rough-edged thoughts skipping about inside him. It wasn’t long afterwards that she left the party with her friend. But he thought of her all night long. 30 comment, I can provide all that, I will keep commenting till ts 30, this story must continue. Lovely story. Wow! I love this already. Looking forward to reading more. Anonymous 09.36, u are so funny! I love the story line, just hope it's worth reading as time goes on. Pls let the story continue. Am loving it already. DNB u guys will pay for my burnt pot of rice on my gas cooker. I was so engrossed in the story I forgot myself. This story must go on and no bad Belle can stop it. Kudos to the writer of this new story. Lovely introduction now I am wondering what happens next. Would he appreciate this dark beauty for who she truly is? Hmmm. This is going to be interesting. Am stuck with the story already. Interesting. More ink to ur pen. Well sound interesting. I hope people wont keep dying and dying oh! I am tired of sad endings. All I can say is WAOH! Please I want more of it. Yes plz continue! Am loving the story already! Plz cari on, d Story Interesting gan... Loving it. A story with a writer as one of the characters is always intresting. This story should continue please. Kudos Dan! Pls continue ! Thank you. Yay!!! Entangled here we go.....30 comments complete! Entangled, stuck on this already. Let the party begin please. 2016 and I'm just seeing it. This id quite interesting.